Manchester United boss Jose Mourinho says he will be “one of the greatest managers in the world” even if he does not win the Premier League at the club. Defending his record, the 55-year-old quoted a German philosopher and said he was “the only manager to win in Italy, Spain and England”. He also said second place last season was “one of his greatest achievements”. Asked if he would still be a great manager if he did not win the title with United – who have won the English top flight 20 times, including 13 Premier Leagues – the Portuguese replied: “Of course. Mourinho’s latest comments come after a news conference during which he demanded “respect” from journalists following Monday’s 3-0 home loss to Tottenham – the heaviest home defeat of his career. He pointed out that the three Premier League titles he had won previously with Chelsea were more than the rest of the division’s managers combined. Before his team’s trip to Burnley on Sunday (16:00 BST kick-off), the Portuguese added: “I had great success last season and that’s probably what you don’t want to admit. “Two seasons ago we had a fantastic season because we won the Europa League. We won it because it was our level. We are the last team in England to win a European competition. “I have won eight titles. I’m the only manager to win in Italy, Spain and England. 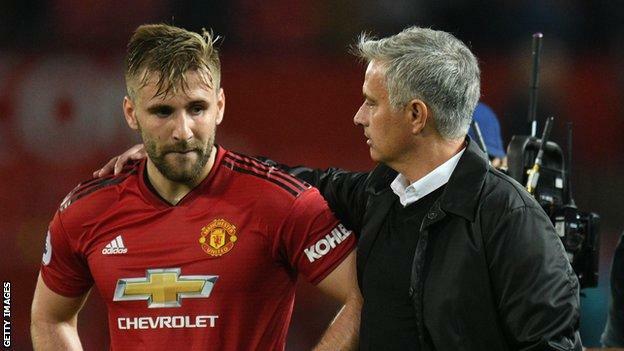 Mourinho also praised defender Luke Shaw – a player he has criticised in the past – who was called up to Gareth Southgate’s England squad for September’s fixtures against Spain and Switzerland. “It’s a big week for him that hangs on a very important match with Burnley,” Mourinho said of the 23-year-old left-back. “He’s played three very good matches and that’s not easy to do when your team loses two of them. He had that balance and consistency, especially against Brighton in a bad team performance. “If next week his manager decides to give him minutes against Spain or Switzerland that would be very good for him. At the minute, that’s a result of the hard work he and the coaches have done. “A proper player is a player of consistency. He’s mentally and physically stronger and tactically he has a better understanding.